Well let us get on to something completely different. For my "La Haye Sainte" scenario, I needed a unit of rocket troops from Captain Whinyates' Rocket Battery of the RHA. This rocket battery was made up of 13 sections each of eight 6pd rockets as well as some cannon. I knew very little about rockets so decided to do some research. I knew that the rocketmen wore the uniform of the Royal Horse Artillery so that was pretty easy. 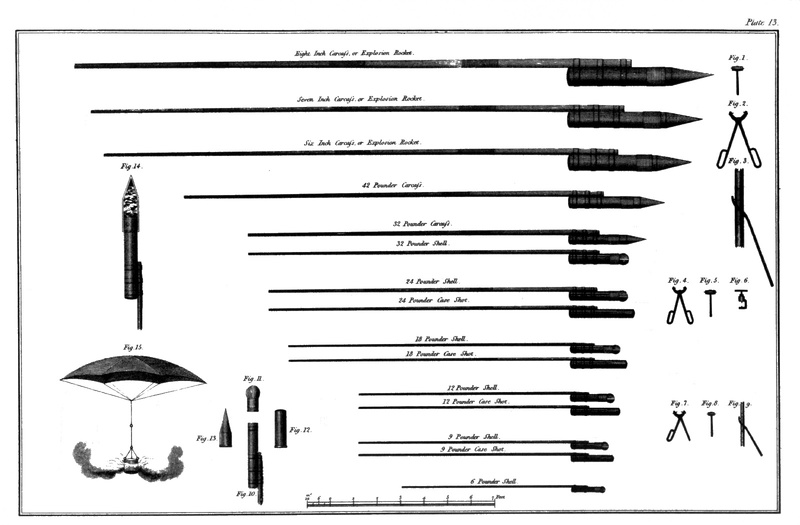 What was confusing though was the contents of the Old Glory British Rocket Troops package. There appeared to be 2 sizes of rockets and apparati. 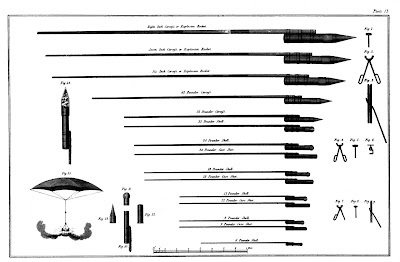 A search through google books revealed Congreave's original treatise and I found out that rockets came in all sizes! After a good sort through the package, I decided to do 3 bases of the big rockets and 1 base of the small 6 pders, I needed for the La Haye Sainte scenario. I could find no reference on what colour to paint the launching apparatus, but decided to go with the British artillery blue-grey. I use GW Fenris Grey for this purpose. 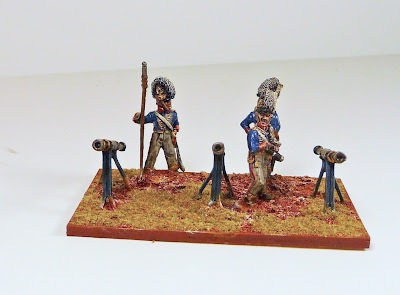 The white primed figures were painted using a Vallejo Prussian Blue and GW Fortress Grey. I have started to modify slightly my method of applying the Army Painter dip. I continue to paint it on generously after I have thinned it slightly and then within 1-2 minutes remove the excess with a dry brush to prevent any heavy build up or pooling. This is working out quite well and has lightened up the figures. After application of the matt varnish, I sometimes do some minimal drybrushing, here I only felt that I needed to touch up the white on the helmet plumes. Saxon Dog who is a far better painter then me, has a nice tutorial on his blog illustrating this method. So here we have 3 bases of the 42pd rockets, they actually would fire them in 2's, so I should have 2 rockets on each apparatus, but I felt this was more illustrative. I have one extra large rocket that I will probably add in when I get a chance. This will represent a full section of rockets. I am sure they will see action in the future. 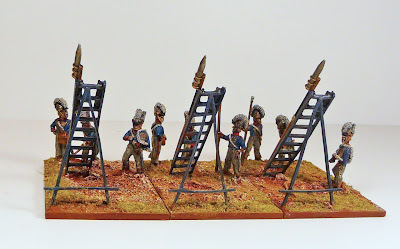 One weakness of the Old Glory miniature rocket set is that these are clearly cannon men and not specialized rocket troops, I suppose I could have done some modifications, but I left them as is. How would this be for some future figures. Maybe someone who knows the Perrys' could send this illustration on to them. 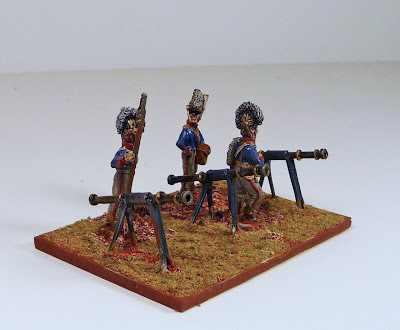 These would be very cool miniature stands! For the La Haye Sainte scenario, I decided to go with one stand with some 6 pders. 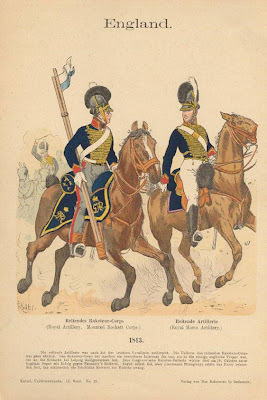 Lt Dansey, RHA was sent forward with 2 guns and some rockets, he left the 2 guns behind and advanced by foot with his rockets to assist in the defense of La Haye Sainte. 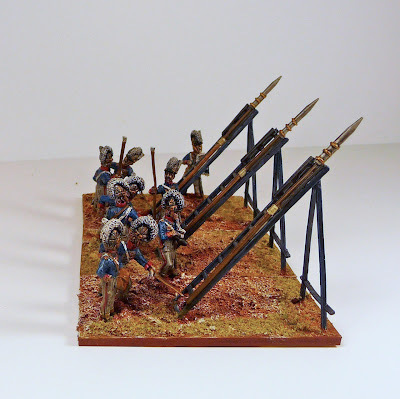 Here we have Lt Dansey and his men with their rockets already to fire at the advancing 13e légere! 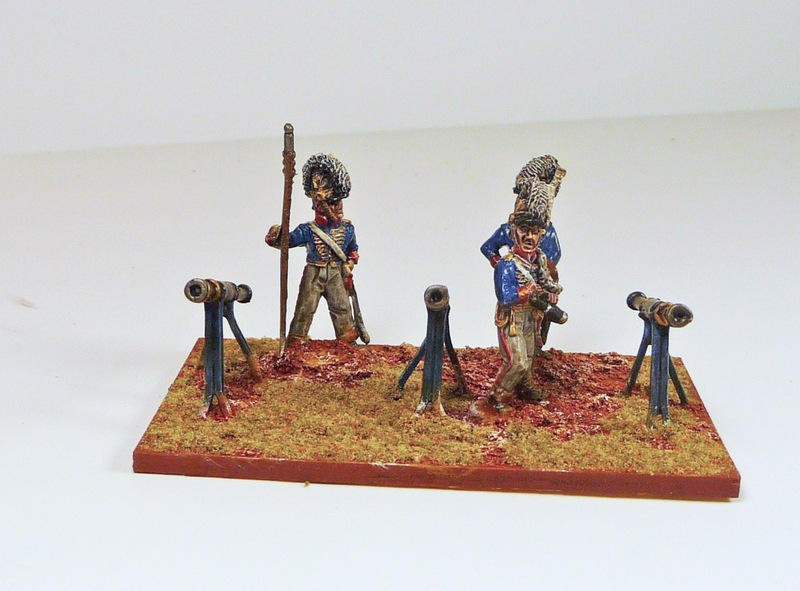 These bases were fun to assemble and although I favour other figures over Old Glory, I am quite happy with these 4 bases. I may even do up one of their rocket limbers in the future. Time to get out the blue paint I suppose. Lovely figures. My own Britsh Rocket Corps never have reached its target in the table game, but they also look very smart! Really like these, they look great! Dansey recalls seeing only ONE rocket frame "“I recollect our seeing it, with its great long frame cocked up in the air, at an angle of about 34 degrees, firing away.”- the rest were fired along the ground by the abatis. Dansey was wounded almost immediately and the firing of the rockets (from the ground) was taken over by Sgt Dunnett. ""Sergeant Daniel Dunnett on perceiving the advance of the nearest French column towards the farm, dismounted his men as coolly and deliberately as if exercising on Woolwich common, though without any support whatever, laid rockets on the ground, and discharged them in succession into the mass, every one of them appearing to take effect. The advance of the column was checked until Dunnett, having expended all his rockets, retired with his party to rejoin the guns in the rear." Apart from this incident the rest of the troop was equipped with five 6-pounders. When am I going to see those old guard/hannovarians/etc etc? Thanks Rafa, I actual found the print of the Rocketmen climbing the rocket launchers on your site. I was trying to figure out who was Anonymous, and I suspect it is you Martin. 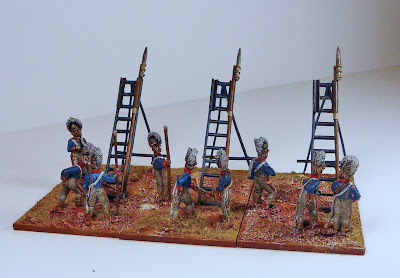 I am working through a lot of half finished units and those Hanoverians are moving up the queue. The Guard are a little further down, but I will get to them. Thanks for the extra info about Lt Dansey. I still have a few small 6 pound rockets left, so who knows, I may add another base. Wow, they look really great! Thanks, I believe I will darken the plumes on the helmet though, they are a little white and supposed to be black. I've got the HaT rocket troop set, but haven't painted them yet as I don'tknow if our club rules cater for rocket fire! I'll have to see if there's any secret special rules; they're just too special not to have in a collection! I love your heavy rocket section; they'd be quite terrifying to face in action. These are up to your usual painting standard, ie. Very impressive!